All aboard the Algoma Central Railway! The highlight of this tour is a wilderness excursion into the spectacular Agawa Canyon. Ablaze with color during autumn, the train ride into the canyon is a favorite way for fall ‘leaf peepers’ to experience some of the most spectacular fall color in North America. This visit to Canada is a feast for the eyes, be sure to bring your camera along so you can share the beauty with your family and friends. Traveling northward through New York State will take us past the Thousand Islands and to our lodging for the evening in Gatineau, outside Ottawa, Canada's capital city. This morning we will visit the Canadian Museum of History. After lunch we will follow the Ottawa River Valley to our lodging for the evening in North Bay, Ontario. Today we will make our way to Sault Ste. Marie with an afternoon stop at the Canadian Bushplane Heritage Centre, which is dedicated to preserving the history of bush flying and forest protection in Canada. Following the lovely North Channel shoreline will bring us to our lodging for the next two nights in Sault Ste. Marie, Ontario. Today we are off on a scenic experience! We will board the Algoma Central Railway for a ride through a vast expanse of forest and mountains interlaced with countless lakes and brawling rivers. 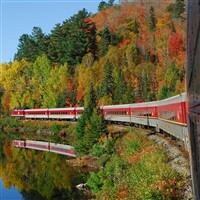 As the train winds its way to Agawa Canyon you will agree that the scenery rivals that in the Canadian Rockies. A two hour stop in the canyon will allow us to photograph the waterfalls and rocky cliffs in this virtually unspoiled area. We will return to Sault Ste. Marie by late afternoon. Our morning travels will take us to Manitoulin Island, the world's largest island, completely surrounded by fresh water of Lake Huron. Passing through Indian Territory will bring us to South Baymouth where we will board the Chi-Cheemaun (the Big Canoe) for a two hour ferryboat ride to Tobermory. Traveling south through the resort area of Bruce Peninsula will bring us to our lodging in Owen Sound. The Elmira/St. Jacob area is much like Lancaster's Amish farmland used to be. We will enjoy a tour of the farmlands and have lunch before traveling on to our lodging for the evening in Niagara Falls, NY. A scenic drive through New York and Pennsylvania will bring us home by late Friday afternoon.